When it comes to wasps in and around the home, the little buggers pack a punch. Spring is finally here and wasps are starting to buzz around and help pollinate the beautiful town of Minnetonka, MN. While wasps remain a large contributing factor to our planet, no one wants them in or around their home. Wasps can cause a major concern for homeowners mainly because of the big, fat stingers they have on their rear ends. While getting stung by a wasp may just hurt a little bit, it can be especially alarming if you have an allergy to them. Swelling, nausea, anaphylaxis, and even death can be caused by the tiniest little sting. For this reason, if wasps are in or around your home, Eco Tech is your best solution. Here at Eco Tech, we are ready and willing to tackle any wasp nest on your property. Serving all of Minnetonka, MN and the surrounding areas, we can help home and business owners remove any pest problem that may arise all throughout the year. We have over 15 years of pest removal experience and do so using only safe, environmentally friendly extermination methods. We pride ourselves in keeping your children, pets, and any other animals safe during the extermination process. Wasps can create nests almost anywhere. 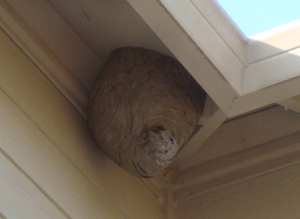 Most commonly, wasps nest in trees or holes, cracks, and corners of homes and businesses. This means that they can be a threat basically anywhere! Trying to remove a large wasp’s hive can lead to attacks and stings on you or anyone in the area. Therefore, hiring a professional to get the job done is the best line of attack! We are thoroughly trained at Eco Tech to handle these pesky stingers and we can get rid of them quickly using our nontoxic organic product line. These treatments keep you and the environment safe so that no one else is harmed in the process. Once the extermination is complete, we are able to perform any home damage repair and preventative measures to keep these pests from coming back again. All of our services come with a 4 year warranty so that you know we mean business! So, don’t let these wasps threaten you in or around your home any longer. If you notice a wasp problem in your home or building, contact Eco Tech today! If you live in the Minnetonka, MN area, call us today at 763.785.1414!